The apartment is located in the heart of the Tuscan countryside, 2km from the historic center of San Miniato, halfway between Pisa and Florence, but also a great distance from Lucca, Siena, Volterra, San Gimignano and many other famous cities. located in the heart of the relaxing and peaceful Tuscan countryside has a prime location for bike rides, forest walks, wine tasting, olive oil and good Tuscan food in addition to visiting San Miniato and the neighboring town centers that offer an immense heritage of art & Culture. The apartment lies in a completely renovated farmhouse with large garden complete with all amenities, Jacuzzi, BBQ, bikes, free WI-FI, private parking and assistance of the owner who resides on site. House was modern and clean w/ air conditioning. 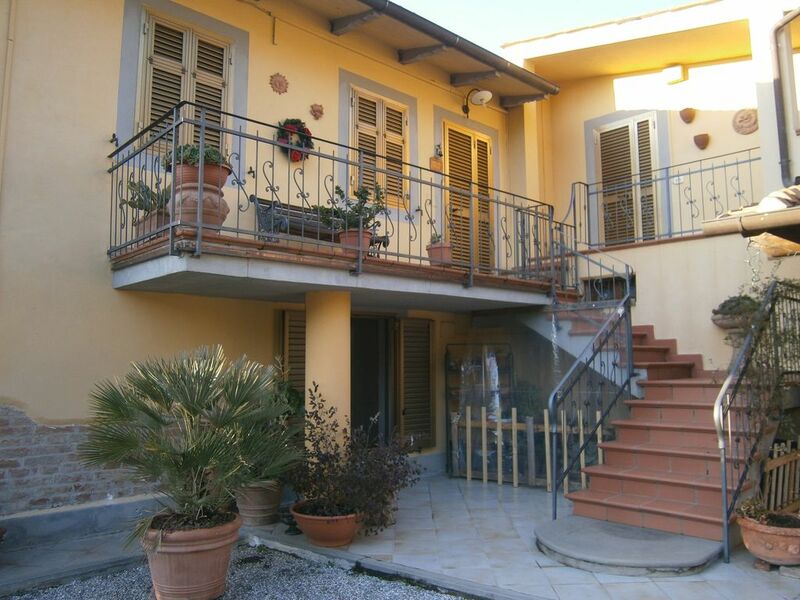 Located in a beautiful setting in Tuscany and has a nice veranda to sit on. The people who owned the house were very kind and understanding. Vittorio and Teresa hosted us in an air-conditioned apartment above their home in the Tuscan countryside. The property is gated and the apartment was very clean and quiet. Olive trees are on the property and Vittorio and Teresa make their own olive oil which is unbelievably good, so much better than we have in the U.S. Upon our arrival we were greeted warmly and shown our apartment by Vittorio. He had a big bottle of water and a bottle of wine for us. When we cooked a meal in our apartment we found the kitchen to well equipped, however there are no paper towels. The apartment was very comfortable, and we would definitely stay there again. Thank you Vittorio and Teresa for hosting us in your beautiful home. We enjoyed our stay very much. You were wonderful hosts. We hope to see you again one day. Vittorio and family made our stay at their vacation home an amazing experience. We visited with our family of 6 (two adults and four children) and the apartment comfortably housed us all. We used the beautiful garden/lawn for badminton and lounging and they generously rounded up bikes for us to tour the countryside, which we did almost everyday. On the days we were not riding, Lucca, Florence, and Pisa were an easy drive away. The large and private deck is nice to eat dinner on and has cool views of the San Miniato. Un grazie di cuore ai gentili ospiti che hanno evidenziato in modo positivo la nostra bella struttura, che quotidianamente curiamo con tanto impegno e passione, tenendo presente anche i suggerimenti degli ospiti stessi, al fine di offrire agli ospiti che seguono servizi sempre migliori per trascorrere una piacevole e tranquilla vacanza, facendo in modo di farli sentire a proprio agio a casa di amici . Good location, very quiet and clean. We stayed at the Atlas apartment of this house from July 12 to July 19 2014 (1 adult and 2 kids aged 9 and 12). We really enjoyed your stay. The area is very quiet and the house is located on a very quiet street (it is a dead end actually and there is no other car passing by). The pictures and the description are accurate. We had access to a very large private terrace with nice views of surrounding hills. The bedrooms with single bed may seem small on the pictures and I found them to be bigger than expected and their respective size was very convenient. The kitchen included all the needed amenities. You really need a car if you stay at this place. The house has secure electronic gates. During our stay, we visited San Gimignano (about 50 minutes from the house), Sienna (60 minutes), Castellina in Chianti (60 minutes; very charming village), San Miniato (7-8 minutes), Lucca (45 minutes), the beach near Livorno (60 minutes) and Firenza. We used to train to get to Firenza (about 30 minutes by train). The train station is located north of San Miniato (about 12-15 minutes from the house). Thank you very much for your help and hospitality. "Choosing an accommodation to stay is basically based on pure luck. For us this was like wining on the lottery. During that 2 weeks we've got the chance to enjoy a brief introduction to the Italian hospitality. So from now on everyone should be compared to Vittorio who is 10/10 on the scale. Anyways excellent location, far from the big city's rush where you lay back and relax after a full day trip." L'appartement la Farfalle est très spacieux, très propre et très bien équipé, idéal pour 4. Nous étions un couple avec 2 jeunes adultes et chacun avait sa chambre. Nous avons apprécié le jardin, le SPA, les climatisations de l'appartement pour éviter la chaleur du mois d'août. San Miniato est situé idéalement pour visiter les principales villes de Toscane (Florence, Pise, Lucques, Volterra, Sienne,...), toutes à moins d'une heure de route. Nous avons été accueillis par Vittorio et Teresa comme chez des amis. Ils ont été à notre disposition à tout moment. Leur maison est située en dehors de la ville, mais les commerces se trouvent à moins de 10 mn en voiture. La région est magnifique et l'accueil à la Farfalle est admirable !! Nous recommandons fortement ! the highway FI-PI-LI exit at San Miniato. -From Pisa airport, take highway FI-PI-LI direction Florence, exit at San Miniato.